Mysuru: With the Mysuru-Kodagu LS Constituency going to polls along with 13 others in the Southern Part of the State on Apr. 18, the public campaign will draw to a close at 6 pm tomorrow (Apr. 16). Addressing a press meet at his Office here this morning, Deputy Commissioner (DC) Abhiram G. Sankar, who is also the District Electoral Officer, said that the District Administration is fully geared up for ensuring free and fair polls. Voting will take place from 7 am to 6 pm on Apr. 18 (Thursday), the DC said. In all, there are 18,95,066 voters in the Constituency and a total of 2,187 booths have been set up across the Mysuru-Kodagu Constituency, which comprises eight Assembly segments — six in Mysuru district and two in Kodagu district. Stating that 2,406 Assistant Polling Booths in-charge and 4,812 Polling Officers have been deputed for poll duty, he said that mustering will take place at 8 centres — one each in every Assembly segment on Apr.17. The mustering centre for NR Assembly segment is at JSS College on Ooty Road, for Chamaraja at Baden Powell Public School, for K.R. at Maharaja’s College Centenary Hall, for Chamundeshwari at Maharani’s Arts College for Women on JLB Road, for Hunsur segment at Devaraja Urs First Grade College, Hunsur, for Periyapatna at Pushpa Convent in Periyapatna Town, for Virajpet at Government Junior College, Virajpet town and for Madikeri segment at St. Joseph’s Convent, Madikeri town. As voter-friendly measures, based on the direction of the Election Commission of India, the District Administration has set up a total of 21 ‘Sakhi Booths’, 11 exclusive booths for tribals and 7 booths for the differently-abled. Also, wheel chairs, magnifying glass and Braille ballot papers have been despatched to all polling booths, the DC said. Continuing, Abhiram Sankar said 5,084 ballot units, 2,671 control units and 2,717 VVPATs will be used for polling in the Constituency and all the EVMs have been checked for their functioning. Stating that all candidates can erect pandals at 200 mts distance from the polling booth, he said that the candidates can have only 2 chairs, a table and a banner of size not exceeding 3×41/2 ft. All the candidates will be allowed to have one polling agent in every booth and the Polling Officers will make arrangements for their seating. After the public campaigning comes to an end at 6 pm tomorrow, candidates can only take out door-to-door campaign in groups not exceeding 5 persons as prohibitory orders under Section 144 of Cr.PC will be in place, he said. Highlighting that as per the ECI directions, conduct / broadcast / publication of exit polls has been banned till May 19, the DC said that all political leaders, workers who are non-voters of the Constituency, have been asked to leave the Constituency soon after the conclusion of public campaign at 6 pm tomorrow. The DC further said that in view of the polls, dry days have been declared from 6 pm on Apr. 16 to midnight of Apr. 18 and all fairs / shanties / festivals scheduled for Apr. 18 have been postponed. The DC gave a clear instruction to the voters that cell phones and cameras will not be allowed inside the polling booth and the Polling Officers have been empowered to act against any voter who is found violating the rule. The DC said that adequate security measures have been taken to ensure free and fair polling, with deployment of adequate Police personnel at all polling booths across the Constituency. Also, apart from the voter ID Card issued by the ECI, the voters can also produce passport, driving licence, employee photo-identity cards issued by State/Central Governments and Private Sectors, Bank/Kisan/Post Office passbook having photograph of the voter, ID card issued under MNREG scheme, Health Insurance/ smart cards having photograph, pension card issued by a competent authority, Aadhaar card etc. The poll officials are empowered to check Kalyana Mantaps, community halls, lodges, private guest houses and other lodging facilities for stay of non-voters after the end of public campaign. Regarding seizure of unaccounted cash and liquor after the poll code came into effect on Mar. 10, the DC said that so far Rs. 43,97,120 cash, 33,810.435 litre of liquor worth about Rs. 1,41,11,837 and publicity and other articles worth Rs. 6,36,300 have been seized in Mysuru district. In Kodagu, so far Rs. 9,59,810 cash, 14,438.47 litres of liquor worth about Rs. 83,35,631 and publicity and other articles worth Rs. 26,15,000 have been seized. MCC Commissioner Shilpa Nag and ZP CEO Jyothi gave a brief on SVEEP programmes and other measures taken for voter awareness and to sensitise the public on the importance of voting. City Police Commissioner K.T. 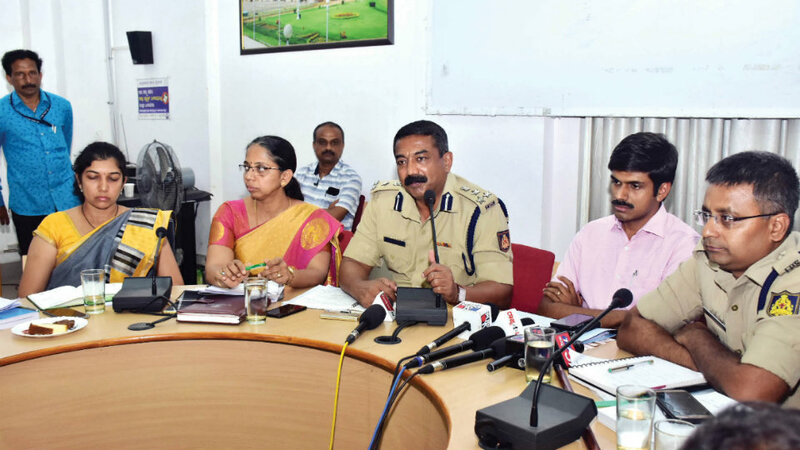 Balakrishna and SP Amit Singh explained the measures taken by the Police for peaceful polls. ADC G. Anuradha and other officials were present.